Sharing the Amtrak story with our customers and the American people is important to us. Each year brings new milestones to our rich history that we have documented in detail below. Please visit the timeline to see how Amtrak has been impacted by important legislation in Congress, how our environmental efforts have evolved over the years and when we have added service to your local or regional community. 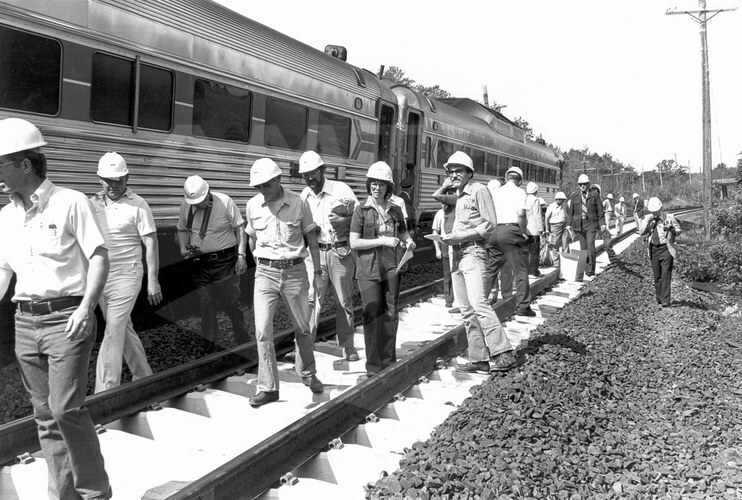 October 30 - President Nixon signs Rail Passenger Service Act, setting Amtrak's transition date to May 1, 1971. December 30 - Eight original Incorporators of the National Railroad Passenger Corporation confirmed; David W. Kendall subsequently elected Chairman of the Board of Incorporators. Twenty railroads eventually opted to participate in the formation of Amtrak, turning over their passenger services to the new company. 1971: Amtrak begins operations on May 1. March 22 - Amtrak formally announces intended routes. March 30 - Amtrak incorporated in Washington, D.C.
April 28 - Roger Lewis confirmed as the first president of Amtrak. 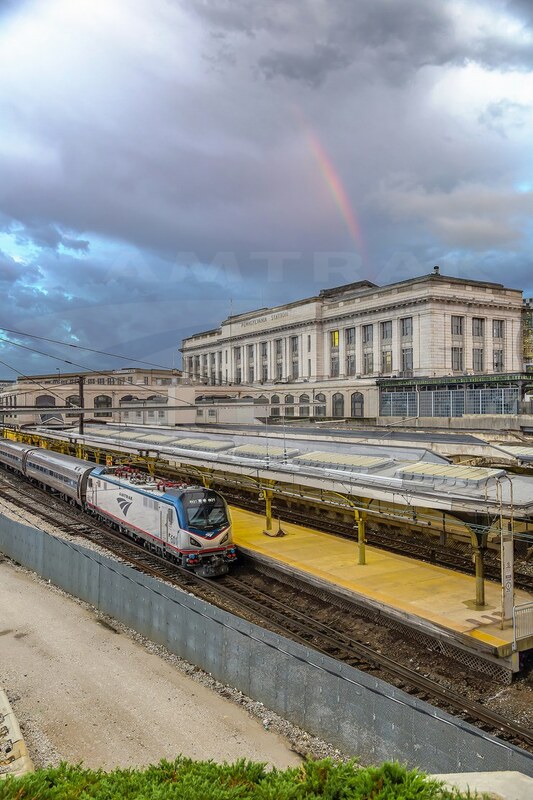 May 1 - Amtrak service begins; the first train operated by the new company is a Clocker (Philadelphia-New York). August - National advertising begins. 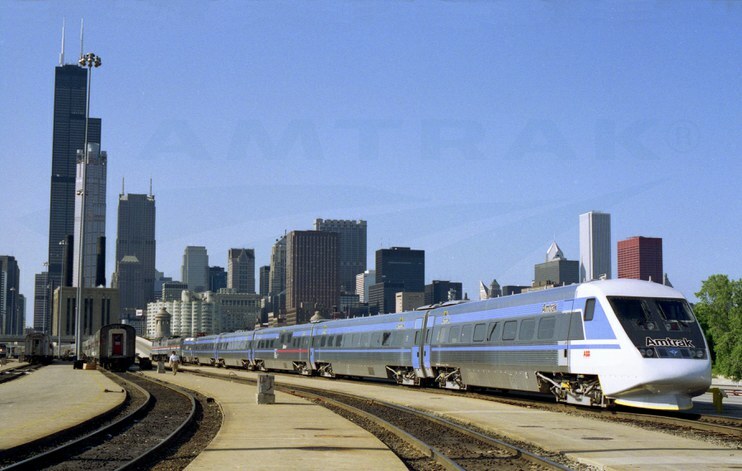 October 1 - Amtrak's first Reservations Sales Office opens in Chicago; it consolidates the separate reservation bureaus of the Atchison, Topeka and Santa Fe, Illinois Central, Burlington Northern, Penn Central and Milwaukee Road railroads, and the Chicago Union Station Company. Amtrak begins service to Vancouver, B.C., and Montreal. October 29 - First brand new station building opens in Cincinnati (known as the "River Road Station"). Amtrak offers 14 daily Metroliner Service trains from New York to Washington, D.C. and 11 trains between New York Penn Station and Boston timetable. Debuts china designs on the Broadway Limited, and then on the Super Chief, Silver Meteor, Panama Limited, Merchants' Limited and Coast Daylight/Starlight. 403(b) services operates with three partners. Mass. (Boston-Worcester-Springfield) - all year. Ill. (Chicago-Quincy) - all year. Pa. (Philadelphia-Harrisburg) (began October 29). Congress passes Amtrak Improvement Act and the Regional Rail Reorganization Act, mandating transfer of operation of the Northeast Corridor to Amtrak. Amtrak orders new locomotives, including SDP-40F diesels, electric locomotives, and "Metroliner-type" cars (later called Amfleets). Lets a contract to specify and design new bi-level cars (later known as Superliners). "Save energy - take our car" campaign targets consumers concerned about rising gas prices. 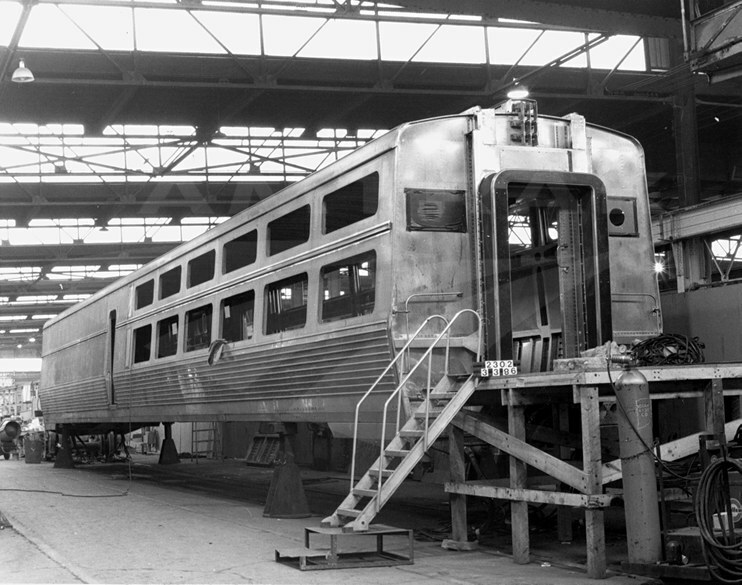 1973: Amtrak begins design process for new bi-level cars. Installs new ticket reservation system, "Automated Reservation and Ticketing System" (ARTS). Operations Department begins the gradual takeover of operations by establishing system of regional superintendents. October - Orders from the Budd Company the first 57 of what is eventually nearly 500 Amfleet cars. Places order for 11 train sets with turbine-powered cars of French design. Amtrak and the Military Traffic Management Command cooperatively develop a military travelers program. Over 1 million people visit Amtrak's exhibit at Expo '74 in Spokane, Wash.
Order for 200 "Metroliner-type" cars ready to be placed. Regional reservation centers in Manhattan, Bensalem, Pa., Jacksonville, Fla., Chicago, Ill., and Los Angeles, Calif., provide 24 hour nationwide toll-free reservations, ticketing, and general information. Travel agents sell $20 million worth of Amtrak travel. 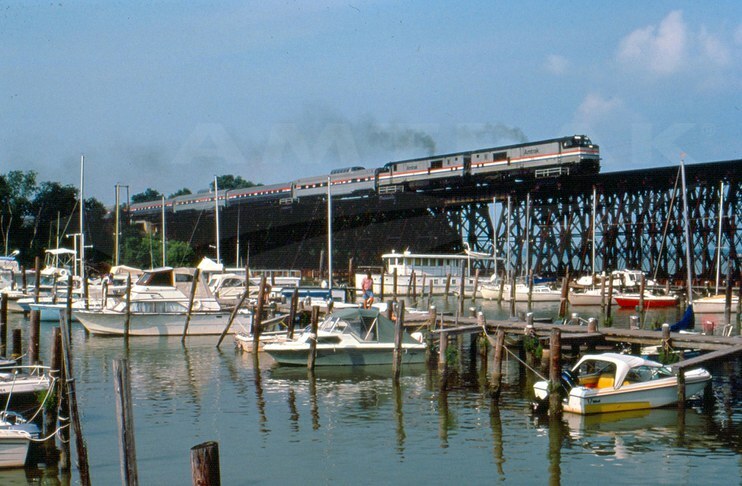 September 15: With the start of Blue Water (Chicago-Port Huron, Mich.) revenue service, Michigan becomes the fifth state to partially finance Amtrak service under section 403(b) of the Rail Passenger Service Act of 1970. March 1 - Paul Reistrup becomes the second president of Amtrak. Establishes new routes, including Norfolk-Chicago, New York/Boston-Chicago, Minneapolis-Duluth state supported service, and Detroit-Jackson (partially funded by Michigan). April - Purchases the Beech Grove, Ind., heavy maintenance facility from Penn Central (PC had been performing heavy overhauls of Amtrak equipment at Beech Grove since early 1972). December - Budd Company turns out one Amfleet car per working day. Initiates a major program to facilitate intermodal travel by providing reservation clerks with information on bus interchange routes. Reaches agreement with the Air Transport Association to provide alternative service during periods of interrupted airline schedules. Introduces USA Rail Pass to overseas markets. 1975: The first Amfleet cars enter revenue service. Orders 235 bi-level Superliner cars for long distance trains from Pullman- Standard Company. January- Acquires the Penn Central passenger yard south of Chicago Union Station and launches a five year rebuilding program. April 1- Amtrak takes over the Northeast Corridor, assuming direct control of trains and track forces, dispatching, signaling and maintenance. Amtrak becomes the first national company to offer reservations service to passengers with hearing disabilities. Both President Ford and President Jimmy Carter make campaign trips aboard Amtrak trains. Amtrak takes over maintenance facilities in Chicago, Ill., Detroit, Mich., Buffalo, N.Y. and the Northeast Corridor. Receives and puts into service 30 F40PH locomotives. Launches the "We've Been Working on the Railroad" marketing campaign. Issues five year improvement plan calling for purchase of new passenger cars and locomotives, modernization of stations and maintenance facilities, and track upgrading. ¾ of Amtrak day service passengers traveling in new cars, either Amfleet or Turboliners. March 31- Kicks off $1.75 billion Northeast Corridor Improvement Program (NECIP), designed to provide regularly scheduled rail travel between Washington, D.C. and New York in 2 hours, 40 minutes and Boston and New York in 3 hours, 40 minutes. Implements automated Ticket-by-Mail (TBM) system. Begins using pre-portioned servings, frozen meal items, automatic beverage dispensing and other modern food preparation methods. 1977: The Northeast Corridor Improvement Project begins. April 25 - Alan S. Boyd elected the third president of Amtrak. 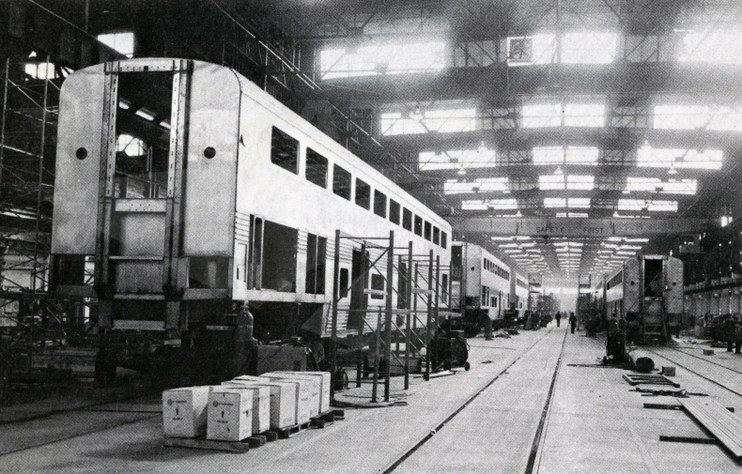 October 27 - Amtrak accepts the first Superliner car from Pullman Standard. Makes interline agreements with 12 new carriers, increasing number of cities served by such connections from 322 to 503. Amtrak writes first "Book of Operating Rules." 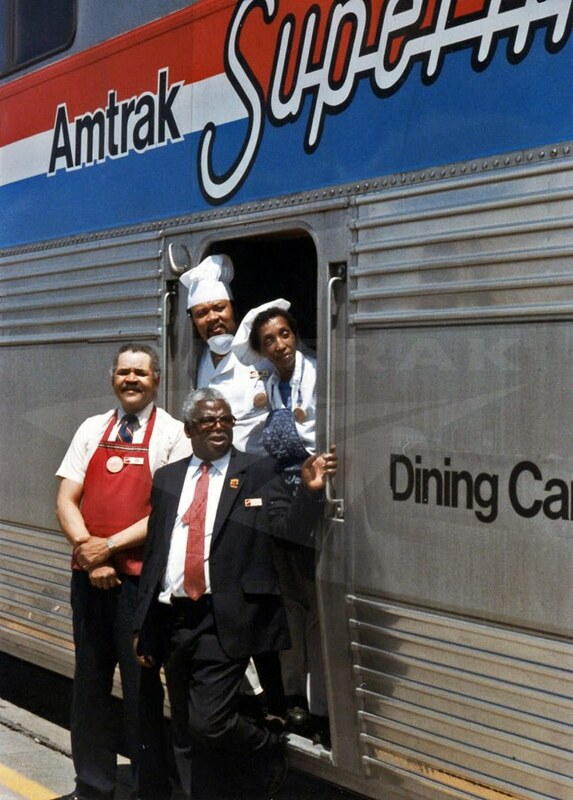 Amtrak is the only railroad consistently meeting the industry's goal of 15% minority business participation. February 1 - Begins operating the Crescent between Washington, D.C., and New Orleans via Atlanta. The service was turned over to Amtrak by Southern Railway (which had called it the Southern Crescent). Completes or rehabilitates 61 stations. Introduces Superliner I, first new long distance car in two decades, on Chicago-Seattle Empire Builder. Receives special Congressional authorization of $23 million for the exclusive use of state-supported services. With the only concrete tie/welded rail machinery at work in the U.S., Amtrak rehabilitates 121 miles of track, including the installation of 296,000 concrete ties and 74 miles of continuous welded rail. May 9 – Locomotive No. 901 becomes the first AEM-7 to enter revenue service. It departs Washington for New York leading Metroliner Service train No. 108. Major corporate effort results in planning the joint development of space and air rights around Philadelphia 30th Street Station. Establishes new state-supported routes in Illinois, Oregon and Pennsylvania and adds service on routes in California and Missouri, bringing the total number of state-supported routes to 15. Introduces slumbercoach service between Washington, D.C. and Montreal and Washington, D.C. and Boston. Introduces Superliners on three additional routes: Chicago-Oakland, Los Angeles-Ogden, and Chicago-Los Angeles. Orders 150 new cars, Amfleet II, (125 long distance coaches and 25 food service cars) from the Budd Company. Tests new automatic self-serve ticketing machines (later known as INSTA Ticket) at Washington Union Station and Philadelphia 30th Street Station. Launches the "America is Getting into Training" advertising campaign. BWI Rail Station dedicated on October 23 as America's first intercity air-rail-ground transportation connection; revenue service began on October 26. Establishes System Safety Program to train and educate employees on workplace safety. Begins testing leased LRC trainsets primarily on the Northeast Corridor. The Amtrak fleet includes 1,436 new or rebuilt all-electric passenger cars and a fuel-efficient locomotive fleet, with an average age of four years. Amtrak gains complete ownership of the Washington Terminal Company, which operates the train facility and trackage within Union Station and Ivy City Yard to Union Station. Previously, CSX held 50% interest. "See America at See Level" advertising campaign launches. Express Metroliner Service (Washington, D.C.-New York) trains make the trip in 2 hours, 59 "civilized" minutes with a 92% on-time performance. Begins marketing our expertise at the Beech Grove maintenance facility to commuter agencies and the heavy equipment industry. Completes a five-year, $44 million project to upgrade the Chicago Yard and maintenance facility, thereby bringing together services previously spread over a half-dozen properties. Introduces Arrow, Amtrak's new nationwide ticketing and reservation computer system, reducing lost call volume to 1% of all calls received. June 11 - W. Graham Claytor, Jr., named the fourth president of Amtrak. Florida becomes the eighth state to participate in the 403(b) program, with the daily Silver Palm (Miami-Tampa). Enhances on-board services including complimentary coffee/tea and newspaper for sleeping car passengers and additional entrees on the dinner menus. Establishes joint Labor/Management Productivity Council. 50% of total operating costs covered with revenue, three years ahead of the Congressional directive. 1983: Amtrak begins Auto Train service. Begins tri-weekly Auto Train service, which becomes so popular, the service is soon expanded to daily operation. 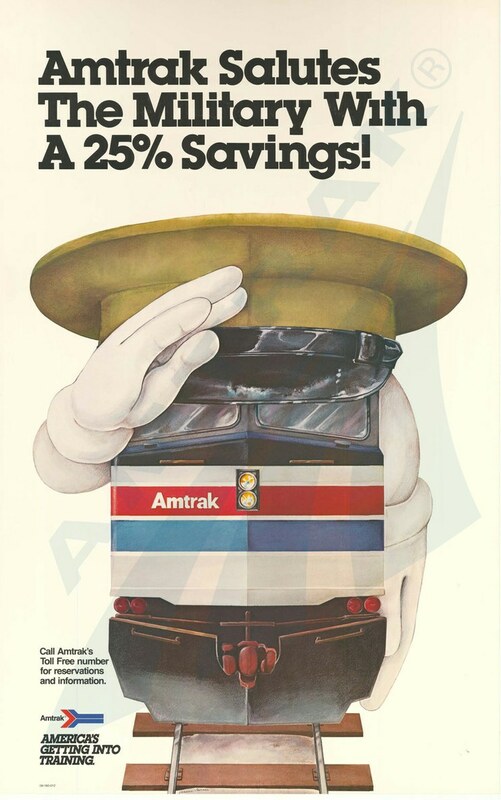 "All Aboard Amtrak" advertising campaign and fare plan begins, designed to acquaint public with the improvements in system and passenger amenities. Establishes "On-Board Chief" program to place supervisors on long-distance trains. For the first time, the number of travel agents offering Amtrak tickets tops 10,000. 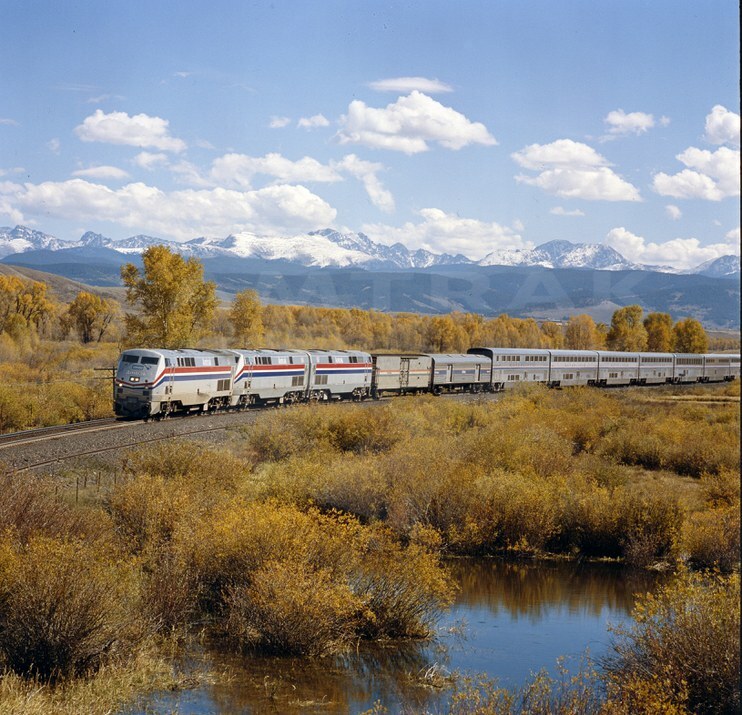 July 15 - Reroutes the California Zephyr from Wyoming through Colorado over Moffat route, replacing the Rio Grande Zephyr, the last privately operated intercity passenger service. Major station rehabilitations underway at Baltimore, Wilmington, Trenton and Newark. Launches Teletrak, providing travel agents with an instant link to Amtrak sales agents. Opens new stations in Anaheim, Oceanside, Galesburg, Tacoma, Omaha and Huntington. Amtrak and the Long Island Rail Road agree to share in modernizing New York's Penn Station, including a state-of-the-art train control system and extensive improvements to all passenger facilities. Begins operating the Beech Grove, the country's most advanced track geometry car, which becomes part of one of the most intensive, successful safety and track quality programs in the rail industry. Employee safety reaches its highest level to date. Begins offering tickets through the TWA and American Airlines ticket reservation systems. route guides, games and movies. Amtrak becomes the first non-airline member of the Airline Reporting Corporation, making it easier for more than 27,000 travel agencies to process Amtrak ticket sales. Introduces enhancements aboard the Southwest Chief, including route guides, souvenir dining car menus, games, movies and guides. Inaugurates Executive Sleeper service on the Night Owl for Washington, D.C.-New York business travelers. Amtrak takes over responsibility for the completion of the Northeast Corridor Improvement Project from the Federal Railroad Administration. Custom Class is introduced to the West Coast on the San Diegans. Adds service to Cape Cod during the summer months, with support from Massachusetts. Railfones become available on all Metroliner Service trains, allowing passengers to place calls to people outside the train. During the first quarter, Amtrak surpasses Eastern Airlines to become the leading Washington, D.C.-New York carrier. Adds route guides, movies, games and a "hospitality hour" to the Empire Builder, California Zephyr and Coast Starlight. Begins modifying electrical equipment on Amfleet cars so that trains can operate in "push-pull" service. New "A-plus" system allows customers to give an agent a credit card number over the phone, and pick up a ticket at the station. Five reservation sales offices combined into three, in Fort Washington, Pa., Los Angeles and Chicago. Publishes a 92-page "Travel Planner" showing in vivid color all the trains, accommodations, and hotel and tour packages available through America's passenger railroad." Develops a "training video cassette"-the first of its kind in the industry-to familiarize travel agents with Amtrak's fares and travel opportunities. Unveils new "Self ServeTicketing" machines at heavily-trafficked stations such as New York, Philadelphia, Washington and Los Angeles. 1986: Viewliner prototypes completed at the Beech Grove Shops. New or refurbished stations open in Salt Lake City, Hartford, Raleigh and Martinez. Introduces nonstop Metroliner Service between Washington, D.C. and New York, featuring complimentary newspapers and New York City subway tokens for sale. 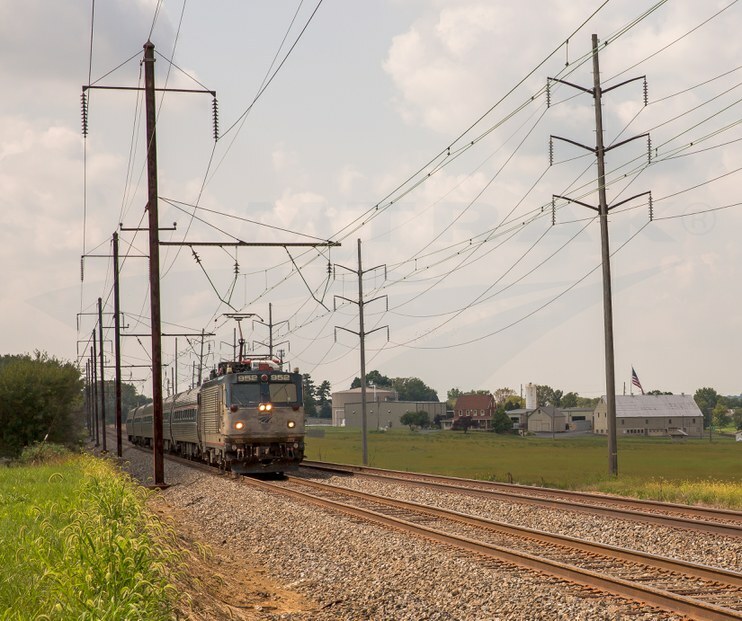 CETC (Centralized Electrification and Traffic Control) takes over complete automated control of traffic and power on the Northeast Corridor between Wilmington and Washington, D.C. Ticket sales by travel agencies increase by nearly 20%. Introduces first computerized "yield management" system to handle ticket sales. Washington D.C.'s restored Union Station reopens to great fanfare in September. Introduces Superliner enhancements including movies, special menus and other amenities on the Texas Eagle and Sunset Limited. Revenue on Northeast Corridor trains grows by more than 15% following the move into the restored Washington Union Station. For the second consecutive year, Amtrak carries more passengers between Washington, D.C. and New York than all of the airlines combined. With sponsorship from Harrah's casino, Amtrak begins service to Atlantic City. Purchases 104 privately-financed Horizon cars from Bombardier, Inc. - first short-distance cars acquired since 1977. Amtrak chefs begin custom food preparation and presentation training at the Culinary Institute of America. Adds morning and afternoon nonstop Metroliner Service. The first of several such lounges, Amtrak's Metropolitan Lounge opens in New York for First class sleeping car and Club Service passengers. Conference Club Car begins regular service on Metroliner Service trains. Adds five new state-supported trains - two Hiawatha frequencies, the Gulf Breeze, the Carolinian and an additional San Joaquin train. initiates the Carolinian (New York-Charlotte) in May. Accepts delivery of 58 Horizon cars. Amtrak places among the top three railroads for safety performance in the industry's annual Harriman Awards competition. President Bush signs the Americans with Disabilities Act. Amtrak's Metropolitan Lounge opens in Chicago. Develops new 3-hour, 55-minute express service between Boston and New York. Adds first class dining facilities to the Auto Train. Travel agency sales account for about 40% of Amtrak ticket sales. April 7 - Completes Empire Connection tunnel in New York; Empire Service trains and those serving other destinations north and west of New York shifted from Grand Central Terminal to Penn Station. 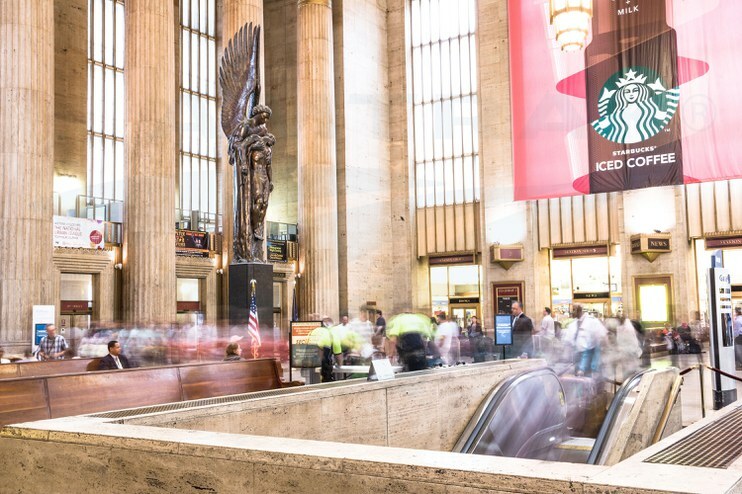 June 14-16 - Rededicates Philadelphia 30th Street Station after a major renovation. For the first time in its history, Amtrak carries more commuter passengers than intercity passengers. Amtrak and Metra join forces to complete the $32 million renovation of Chicago's Union Station and facilities. Amtrak's Metropolitan Lounges open at Philadelphia 30th Street Station and Washington Union Station. Amtrak begins testing of the German ICE and Swedish X2000 trains on the Northeast Corridor; both operate at 135 mph and the ICE train reaches 162 mph. X2000 spends five months in revenue service, ICE train spends two months in service. 1993: The X2000 visits Chicago during its national tour. January marks the first full month of Capitol Corridor trains in California, and by April, 100,000 people use the trains. Delivery of 20 new diesel locomotives, P32-8BWH - first of the new generation of GE-built engines. Attains 43% share of air-rail market between Washington, D.C. and New York. Begins procurement process for an order of 26 high-speed train sets. Sunset Limited extends east to Miami. Received delivery of 22 P40 locomotives. Viewliner order placed for 50 sleeping cars. December 7 - Thomas M. Downs becomes the fifth president of Amtrak. Begins operation of leased Talgo trains in partnership with Washington State Department of Transportation. Completes first phase of modernization of New York's Penn Station Control Center. Eight states increase financial support for Amtrak partnerships. Amtrak headquarters is divided into three Strategic Business Units: Northeast Corridor, Intercity and West. A streamlined corporate headquarters remains in Washington, D.C.
Launches Amtrak.com, ushering the company into the Internet age. The site offers information about Amtrak services, but not online booking capabilities. North Carolina inaugurates state-supported Piedmont service. between New Haven, Conn., and Boston. Introduces Vermonter service in partnership with the state of Vermont. Begins program to upgrade Amfleet I cars with amenities such as 110V electric power for early laptop computers and accessible restrooms. Formal groundbreaking ceremony for North End electrification, allowing faster speeds between New Haven and Boston. During January blizzard, Amtrak is the only intercity mode to maintain service on the Northeast Corridor. Introduces CPR and first aid training for crew members as part of annual emergency training curriculum. Donates $2 million to inaugurate the Great American Station Foundation, set up to help communities repair and improve their train stations. Ethan Allen Express debuts in December, providing the first direct rail service between New York and Rutland in forty years. For the first time, an Amtrak service covers its operating costs - Metroliner Service generates $14 million. July - Upgrades to Amtrak.com allow customers to make reservations online. 190 self-service ticket machines in service nationwide. To provide a smoke-free environment while still accommodating smokers, Amtrak introduces special self-contained ventilated smoking rooms on 59 long-distance cars. Metroliner Service sets a ridership record. Clears Ivy City yard to permit construction of high-speed rail maintenance facility in preparation for Acela Express. Delivery of 111 new P42 diesel locomotives. Amtrak is up to 11 state partners. December 11 - Amtrak President Thomas Downs resigns; George Warrington is appointed acting president. Passenger revenue passes $1 billion for the first time in Amtrak's history. Amtrak partners with nine states to propose the Midwest Regional Rail Initiative. Launches Res2000 to improve station ticketing, reservations, customer information and accounting functions. Consolidated National Operations Center (CNOC) opens in Wilmington, Delaware. Renovates stations in Seattle, Centralia, Salem, and Sacramento. December 21 - George Warrington, who had served as acting president since Dec. 1997, is named the sixth president of Amtrak. After a 20-year absence, Amtrak reintroduces passenger service in Oklahoma with the Heartland Flyer. Amtrak declares its computer systems "Y2K compliant." First rebuilt Amfleet cars emerge from the "Capstone" program, designed to enhance comfort, standardize equipment configurations, and comply with the requirements of the Americans with Disabilities Act. January 31 - First electrified service across the entire Northeast Corridor begins when Acela Regional No. 131 runs from Boston to Washington without changing power. Ridership on newly electrified regional service to Boston grows by 45% and revenue increases by 77%. Online passenger ticket sales grow to $63 million, or 5.1% of total automated ticket sales. Amtrak.com named "one of the most bookmarked sites on the web" by HotLinks. Completes Northeast High-Speed Rail Improvement Project (NHRIP) to electrify the North End. September - Launches Arrive magazine to deliver business, lifestyle and travel news that strengthens the Acela brand. Actress Melina Kanakaredes graces the first cover. December 11 - First Acela Express trainset enters revenue service, making one daily round trip between Washington and Boston. 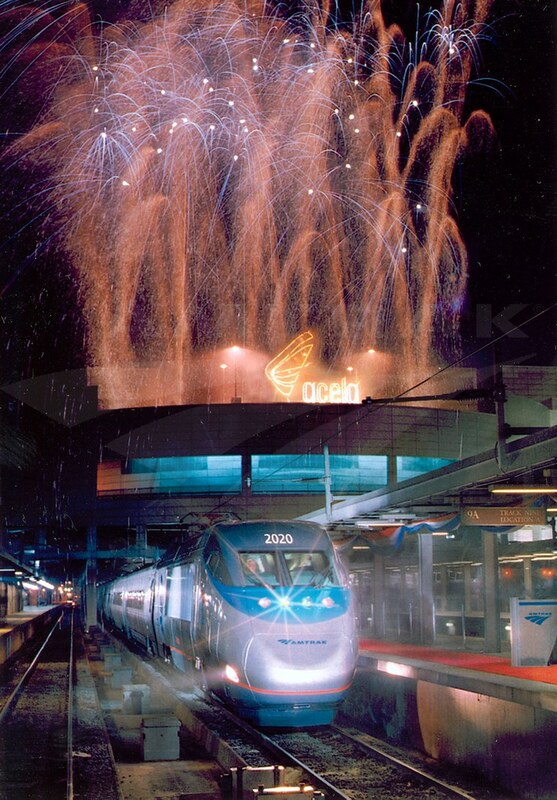 2000: Acela Express enters revenue service in December. In its first full year of limited operation, Acela Express carries approximately a million passengers. February - Introduces "Quiet Cars" on select Metroliner Service trains. The popularity of these cars, where passengers are asked to limit conversation, speak in subdued tones and not make phone calls, leads Amtrak to soon expand their use. Just before the Thanksgiving rush, Amtrak launches "Julie," an automated voice response technology developed by "Speechworks" in Natick, Mass. 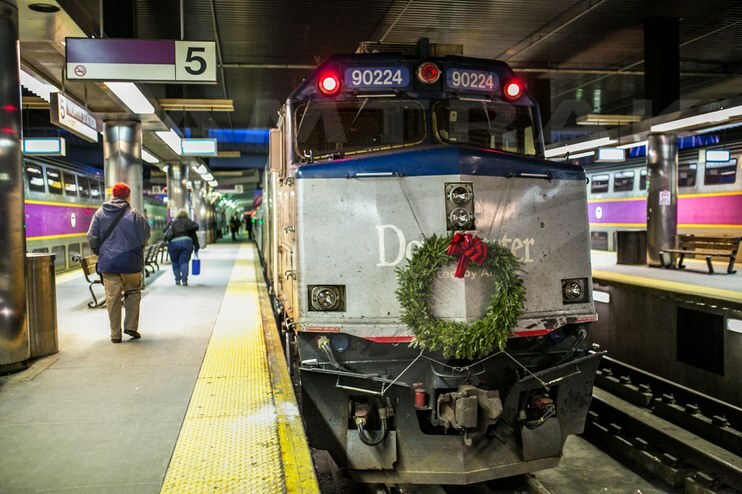 December 15 - Amtrak inaugurates Downeaster Service between Portland, Maine, and Boston. May 15 - David Gunn becomes the seventh president of Amtrak. for top speeds of 110 mph between Philadelphia and Harrisburg, Pa.
August 29 - Alexander Kummant appointed as the eighth president of Amtrak. Fourteen states contract with Amtrak for state-supported trains, representing nearly half of our daily departures. November 26 - Joseph H. Boardman appointed as the ninth president of Amtrak. Safe-2-Safer initiative launched, to improve security and reduce injuries by developing a collaborative approach to safety and accident prevention. Amtrak's farebox recovery - 71 percent - is the highest reported among passenger and commuter railroads in the United States. 2010: The Heartland Flyer runs on 20 percent biodiesel fuel. Amtrak carried nearly 30.2 million passengers in Fiscal Year 2011; it was the best year to date for Northeast Regional service between Boston and Washington, DC. The 40th Anniversary Exhibit Train begins its year-long tour on National Train Day; it eventually visits 45 cities and welcomes more than 85,000 visitors. eTicketing pilot test introduced on the Downeaster service and the Auto Train. Amtrak receives $562.9 million RRIF loan from the FRA to purchase 70 new, energy efficient, high-performance Siemens electric locomotives for the Northeast and Keystone Corridors. "Amtrak Connect" Wi-Fi equipment installed on more than 450 Amfleet®; by the end of 2011, approximately 75 percent of all Amtrak passengers had access to free on-board Wi-Fi. Proposed “Gateway Project” announced—includes construction of two new rail tunnels between New Jersey and Manhattan, a new Portal Bridge over the Hackensack River, and other improvements. Enhancements to the Los Angeles and Hialeah rail equipment maintenance facilities improve working conditions for employees who service and perform safety inspections on the passenger rail cars used on long-distance routes and state-supported corridor services. Achieves regular speeds up to 110 mph on Amtrak-owned track between Kalamazoo, Mich., and Porter, Ind., as well as in Illinois between Pontiac and Dwight. These improvements are the result of partnerships with state and federal governments. Attains Climate Registered™ status by successfully measuring its carbon footprint according to The Climate Registry’s best-in-class program. With this status, Amtrak takes a major step toward reducing its energy usage, costs and carbon emissions. Establishes four Operations business lines—Northeast Corridor Services, Long-Distance Services, State Supported Services and Commuter Services—to provide clear accountability for the financial performance of individual trains and to improve customer service delivery. May 7 - Moves the Mid-Atlantic Centralized Electrification and Traffic Control (CETC) function from Philadelphia 30th Street Station to the dispatching center at the Consolidated National Operations Center in Wilmington, Del. July 30 - Implements eTicketing across the entire national network including the Northeast Corridor, state-supported routes and long-distance services. Launches new Amtrak History website and archives with digitized timetables, advertisements, route guides and other memorabilia that tell the company’s story. December 12 - In partnership with the Commonwealth of Virginia, extends daily Northeast Regional service to Norfolk, Va., providing intercity passenger rail service to South Hampton Roads for the first time since 1977. Downeaster Service also expanded to Freeport and Brunswick, Maine. 2014: New Amtrak Cities Sprinter locomotives enter revenue service. Following Hurricane Sandy, works quickly to reopen four of six flooded rail tunnels connecting Manhattan with the mainland. Storm surge caused them to flood for the first time since they were built in the early 20th century. Through the strong support of New York State, Amtrak signs a long-term lease agreement with CSX Corporation to take full control of the Hudson Line between Schenectady and Poughkeepsie, thereby ensuring that passenger rail service has scheduling priority while also paving the way for significant rail improvement projects. Announces that in FY 2012, Amtrak covered 88 percent of its operating costs with ticket sales and other revenue. January 1 – Amtrak introduces the “Select Executive” tier within Amtrak Guest Rewards for members who earn 20,000 or more qualifying points in the calendar year. April 29 – Auto Train passengers gain the opportunity to purchase Priority Vehicle Offloading which guarantees that a vehicle will be one of the first 20 offloaded from the train. Announces upgrades in May to the AmtrakConnect cellular-based Wi-Fi service to take advantage of 4G technologies. June 26 – Sets a goal that 25 percent of all new hires by 2015 should be military veterans. June 26 – Unveils a specially painted locomotive, P-42 No. 42, to commemorate the 50th anniversary of the Vietnam War and honor all American veterans. The red, white and blue paint scheme includes a special “America’s Railroad Salutes Our Veterans” logo. October 15 - Negotiates contracts with 19 state transportation departments and other entities to increase state control and funding of 28 passenger rail routes under the provisions of the Passenger Rail Investment and Improvement Act of 2008. November 15 - The Heartland Flyer marks its one-millionth passenger, represented by university student Rooke Jackson of Oklahoma City. Expands Safe-2-Safer program by establishing 28 steering committees that work to remove approximately 700 safety barriers across the Amtrak system. Completes reorganization of the Operations department into three new business lines: State-Supported Services; Northeast Corridor Services; and Long-Distance Services. January – Railway Age magazine names Amtrak President and CEO Joseph Boardman its 51st “Railroader of the Year.” W. Graham Claytor Jr. was the last Amtrak chief executive to win this award, in 1989. February 7 – Locomotive No. 600 becomes the first Amtrak Cities Sprinter (ACS-64) to enter revenue service, leading Northeast Regional train No. 171 from Boston to Washington. 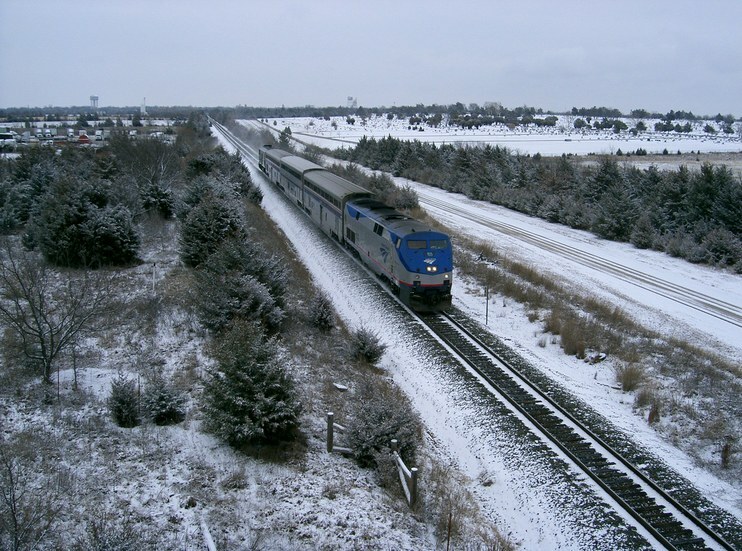 February 10 – Amtrak provides Wi-Fi coverage to about 85 percent of passengers with the launch of AmtrakConnect Wi-Fi service on eight key state-supported routes in Illinois, Michigan, Missouri and Wisconsin. March – In conjunction with Draftfcb, develops new advertising campaigns for long-distance and Northeast Regional trains. The former showcased train amenities and included the sign-off “Making 500 destinations a far better ride.” The latter campaign promoted Northeast cities by symbolically showcasing the train arriving in the middle of the action. June 11 – Amtrak launches a Chinese-language version of its website (zh.amtrak.com) to serve as a resource for the increasing number of Chinese-speaking residents of and visitors to the United States. September 24 – Selects 24 members of the literary community as the first group of writers to participate in the #AmtrakResidency program. Over the next year, they worked on writing projects of their choice in the unique workspace of a long-distance train. December 29 – Switches the route of the Vermonter to the Connecticut River Line (Knowledge Corridor) in western Massachusetts. Consequently, new stations open in Northampton and Greenfield, Mass., while the Amherst stop is discontinued. New and rehabilitated stations open in Denver, Colo.; St. Paul, Minn.; Anaheim, Calif.; Dearborn, Mich.; Winter Park, Fla.; and Longview, Texas. Amtrak increases Thruway bus connections along the Gulf Coast and in Montana, Virginia, Indiana, Ohio, Kentucky and Tennessee. In FY 2014 (Oct. 2013 - Sep. 2014), carries 30.9 million passengers and earns $2.2 billion in ticket revenue. March 30 – Amtrak is named to the first-ever “America’s Best Employers” list issued by Forbes magazine. June – Train dispatchers in New England now work out of a brand new facility at Boston South Station that incorporates energy-efficient technology, new equipment and customized workstations. July 23 – Unveils a prototype retractable setback-shuttle platform at the Ann Arbor, Mich., station. The platform, which mechanically extends toward the train, bridges the gap created when a level-boarding platform is needed. The prototype will remain in use for a two-year test period. September 14 – The Marketing department launches the new Master Brand advertising campaign: “500 Destinations, Infinite Stories.” It was created in coordination with advertising agency FCB Garfinkel. 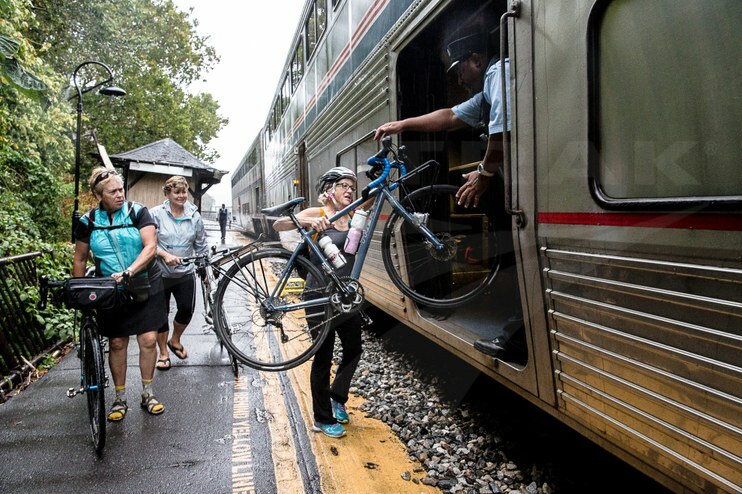 2015: Amtrak expands walk-on/walk-up bicycle service. October 1 – A cost allocation policy, a key requirement of the Passenger Rail Investment and Improvement Act of 2008 (Section 212), becomes effective. Developed by the Northeast Corridor Commission, which includes representatives of Northeastern states, the U.S. DOT and Amtrak, the policy creates a formula by which Amtrak and commuter operators will contribute operating and capital funds to the Northeast Corridor. October 1 – A Blue Ribbon Panel appointed by Amtrak releases a report that provides recommendations to eliminate “Chicago Gateway” delays to passenger and freight traffic. Recommendations include co-located dispatchers, improved operating practices and funding for priority projects already identified in northern Illinois and Indiana. December 4 – The Fixing America’s Surface Transportation (FAST) Act (P.L. 114-94), becomes law. For the first time in transportation legislative history, intercity passenger rail and Amtrak reauthorization language are included as part of a multimodal transportation bill. December 17 – Shifts the route of the Texas Eagle between Fort Worth and Dallas to tracks shared with Trinity Rail Express commuter trains, thereby avoiding congested freight train operations. December – Amtrak achieves its goal of hiring veterans as 25 percent of all new hires between 2013 and the end of 2015. December – Amtrak activates Positive Train Control, a safety technology designed to match train speed to track conditions for improved safety, on track between New York and Washington, D.C. This completes PTC installation on most Amtrak-owned infrastructure on the Northeast Corridor spine between Washington and Boston. Increases the number of trains that offer walk-up/walk-on bike service to also include the Capitol Limited, Carolinian, Heartland Flyer, Crescent and Silver Service trains. New and rehabilitated stations open in Tukwila, Wash.; Holyoke, Mass. (new Vermonter station); Sandpoint, Idaho; Galesburg, Ill.; Claremont, N.H.; Orlando, Fla.; and Salinas, Calif. In FY 2015 (Oct. 2014 - Sep. 2015), carries 30.9 million passengers and earns $2.2 billion in ticket revenue. January 11 – Amtrak announces that the Winter-Spring 2016 Amtrak System Timetable will be the last printed version published and distributed; focus shifts to a digital timetable. March – Introduces a new Student Discount that gives students ages 17-25 a 15 percent discount on the lowest available Value Fares all year long. June 16 – Amtrak, PennDOT and partners unveil the Philadelphia 30th Street Station District Plan, which envisions 40 new acres of open space and 18 million square feet of new development around the station, including a new mixed-use neighborhood atop 88 acres of rail yards. 2016: Amtrak and partners unveil the 30th Street Station District Plan. June 18 – Organizes a special excursion trip between Washington and Philadelphia to bid farewell to the venerable AEM-7 locomotives. AEM-7 No. 942, followed by No. 946, pulled the excursion train. June 20 – Amtrak and the San Joaquin Joint Powers Authority add a seventh daily San Joaquins round trip. August 26 – Announces a contract with Alstom to produce 28 next-generation high-speed trainsets that will replace the equipment used to provide Amtrak’s premium Acela Express service. The contract is part of $2.45 billion that will be invested on the Northeast Corridor as part of a multifaceted modernization program. August – Amtrak Cities Sprinter (ACS-64) locomotive No. 670 enters revenue service, marking delivery of the 70th and final ACS-64. September 1 – Charles W. "Wick" Moorman IV becomes the tenth president of Amtrak. Mr. Moorman had retired as chairman and CEO of Norfolk Southern Corporation in 2015. October 1 – Unveils The National, its first national on-board magazine. October – Amtrak is the first railroad to earn a five-year accreditation by the Emergency Management Accreditation Program. November 7 – In partnership with the LOSSAN Rail Corridor Agency, state of California and BNSF Railway, adds two daily frequencies to the Pacific Surfliner service. The successful pets and bikes programs expand to most long-distance and state-supported trains. New and rehabilitated stations open in Needles, Calif.; Waterloo, Ind. ; Osceola, Iowa; Mystic, Conn.; East Lansing, Mich.; and Dwight, Ill. In addition, Arcadia, Mo., is added as a stop on the Texas Eagle, restoring passenger rail to that community for the first time since 1968. In FY 2016 (Oct. 2015 - Sep. 2016), carries 31.3 million customers and earns $2.14 billion in adjusted ticket revenue. January 7 – Amtrak launches the seasonal Amtrak Winter Park Express, linking Denver Union Station directly to the slopes of the famed Winter Park Resort in the Rockies. July 1 – As of this date, more than 7 million members are enrolled in the Amtrak Guest Rewards program. July 10 – Begins a major infrastructure renewal program at New York Penn Station, which accelerates important construction work. This initial phase, completed on Sept. 5, focuses on “A Interlocking” and includes installation of nearly 900 track ties, 1,100 feet of rails, seven turnouts and four complex diamond crossings. Amtrak and commuter train schedules are modified during the work period, with some Empire Service trains using Grand Central Terminal. 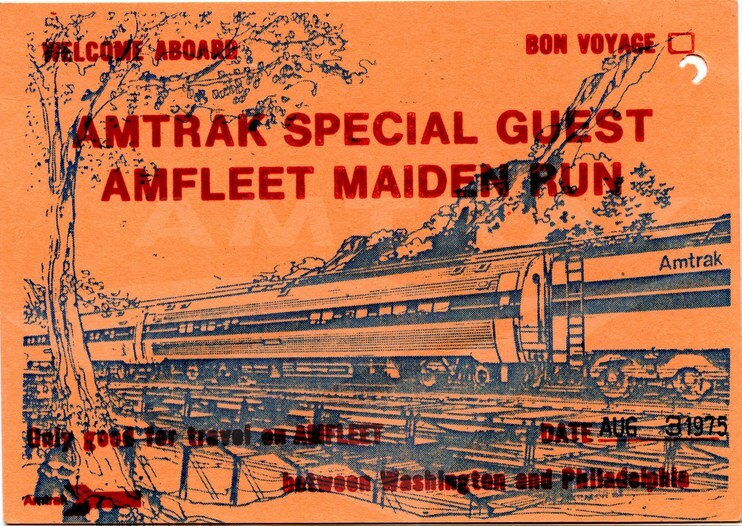 2017: Amtrak begins a refresh of the Amfleet I cars. July 12 – Richard Anderson becomes the eleventh president of Amtrak, and serves as co-CEO with Wick Moorman (who steps down as co-CEO on Dec. 31). Mr. Anderson spent 25 years in the aviation industry, where he served as the CEO of Delta Air Lines from 2007 to 2016. 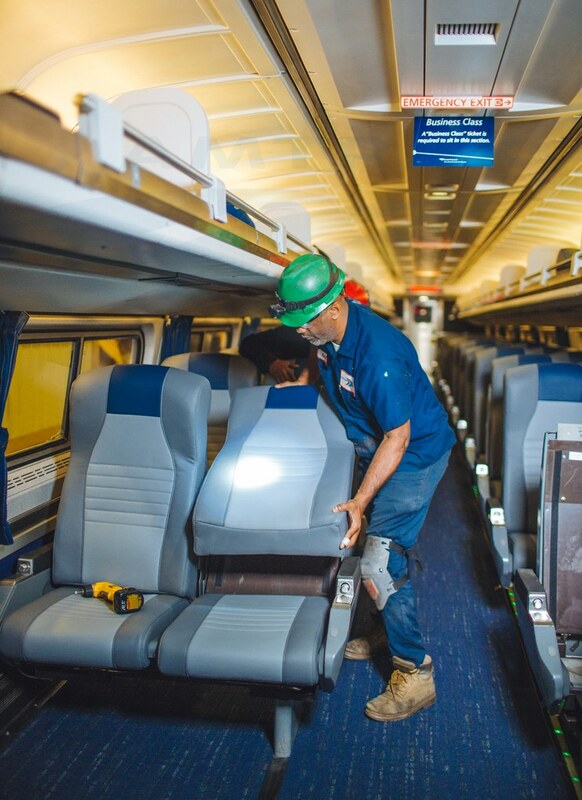 September 7 – Announces an extensive refresh of the train interiors on the approximately 450 Amfleet I cars used on more than a dozen popular services in the Northeast and Midwest. September 12 – Launches a new national advertising campaign that urges travelers to “Break the Travel Quo.” Going head-to-head against some of the pain points of modern day travel, it reminds consumers that Amtrak is a far easier, more comfortable and convenient way to travel. The campaign is created in coordination with FCB New York. September 25 – Amtrak Police, Operation Lifesaver and local, state, federal and railroad law enforcement officers team up for "Operation Clear Track,” the largest simultaneous railroad safety law enforcement operation ever assembled in the U.S.
October 2 – Unveils the “Ready to Build” campaign, which showcases critical bridge, tunnel and station investments that are vital to the realization of a renewed, modern passenger rail system. Autumn – New Siemens Charger diesel locomotives capable of speeds up to 125 mph are introduced on state-supported routes in the Midwest and Pacific Northwest. Purchased by a consortium of states, the units are maintained by Amtrak. Completes “Project unITy,” a corporate-wide effort to integrate, simplify and centralize technology and data services among Amtrak’s national workforce. New and rehabilitated stations open in Sacramento, Calif.; Alton, Carlinville, Lincoln and Pontiac, Ill.; Rochester, N.Y.; and Wallingford and Meriden, Conn. In addition, on Oct. 31, Amtrak, Virginia and the city of Roanoke celebrate the return of intercity passenger rail – via the Northeast Regional – to the “Star City” after a 38-year absence. In FY 2017 (Oct. 2016 - Sep. 2017), Amtrak carries 31.7 million customers and earns $2.24 billion in ticket revenue. January – Amtrak begins dispatching trains on the approximately 231-mile corridor between Porter, Ind., and Dearborn, Mich., which is jointly owned by Amtrak and the Michigan Department of Transportation (MDOT). Thanks to federal funding, MDOT made improvements to the line for more efficient operations. March – Amtrak begins accepting Diners Club International, JCB and UnionPay credit cards, making it easier for international customers to pay for Amtrak services. The previous year, Amtrak served visitors from 195 countries. May 26 – As part of Infrastructure Renewal at New York Penn Station, crews replace and upgrade track on the Empire Tunnel/Connection; update mechanical and electrical equipment on the Spuyten Duyvil Bridge damaged during Superstorm Sandy; and renew turnouts, track and ties on Track 19. As a result, Empire Service, Maple Leaf, Adirondack and Ethan Allen Express trains are rerouted to Grand Central Terminal through Sept. 3 (Lake Shore Limited customers transfer at Albany-Rensselaer). May – Publishes the last issue of Ink, its print magazine for employees; internal corporate news migrates to all-digital platforms. May – Begins a 14-month, $4 million refresh of Acela Express train interiors to include new cushions, seat covers and carpet. June 4 – Adds a third frequency to the daily Piedmont service (Raleigh-Charlotte) in partnership with North Carolina. June 16 – With the Connecticut Department of Transportation, launches additional Amtrak service on the Springfield Line and assists the state in its implementation of CTrail Hartford Line Service. November 12 – Amtrak and the Northern New England Passenger Rail Authority now operate all five Downeaster weekday round-trips between Boston and Brunswick (rather than terminating some trains at Portland). December 21 – Awards an $850 million contract to Siemens Mobility for 75 new Tier 4 passenger diesel locomotives and associated services. The units will offer the latest safety systems, have 4,400 horsepower and be capable of speeds up to 125 mph. December – By the end of the year, all Amtrak-owned or controlled track has Positive Train Control (PTC) in operation except approximately four miles of slow-speed track in the complex Chicago and Philadelphia terminal areas. Amtrak trains also operate with PTC on approximately 16,600 miles of host railroad-controlled track. Reaches new seven-year labor contracts with all unions providing reasonable wage increases for employees and medical plan cost control. Implements a Safety Management System (SMS), a proactive risk management system which builds on predictive safety management methods. Amtrak is the first major U.S. railroad to deploy SMS. Manufacturing begins for the new Acela Express trainsets at the Alstom facility in Hornell, N.Y.
New and rehabilitated stations open in Birmingham, Ala., Joliet, Ill., Schenectady N.Y., Raleigh, N.C., Berlin, Conn., and North Charleston, S.C. Amtrak also begins serving the existing New Haven-State St., Conn., station, and the town of Marks, Miss., becomes a stop on the daily City of New Orleans.